Welcome back to the Arne Wellness Center blog! In our last few blog posts, we’ve been spending some time looking at the importance of nutrition when recovering from an auto injury, and how good nutrition can alleviate inflammation that contributes to pain and other symptoms. Keeping with this theme, we’d like to explore some of the most effective ways to reduce inflammation immediately after you become injured, as well as when you experience flare-ups during the healing phase. 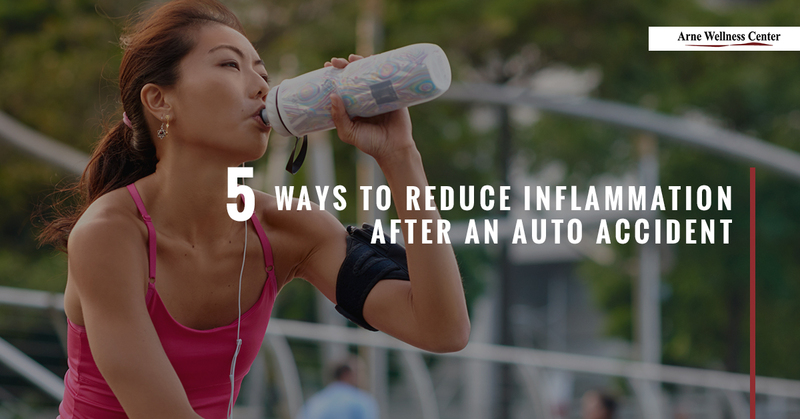 Here are five ways to alleviate inflammation caused by an auto accident. One of the best things you can do for an injury is to stay hydrated. Our bodies tend to hold onto toxins we get in the foods we eat and the air we breathe, which can contribute to inflammation and swelling. Hydrating throughout the day will help detoxify your body of these toxins while restoring much need nutrients to injured soft tissues. As your tissues are replenished, the nutrients they receive help fight inflammation that causes pain and discomfort. Inflammation can limit your range of motion, movement, and mobility, but this doesn’t mean you should stop moving altogether. Maintaining healthy movement can actually reduce inflammation because movement promotes lymphatic flow which ultimately increases circulation. This allows the nutrients and oxygen you get from healthy foods and water to replenish damaged tissues, while also removing and disposing of lactic acid and other toxins that can build up in injured areas. Rest is also important in the acute stage of an injury, especially if you have suffered a sprain/strain or broken bone. While exercise and movement are important when you’re healing from an injury, resting for the first few days after your accident will give your body a chance to start healing. The important thing is that you’re continuing to hydrate, elevating injured extremities to stimulate proper circulation, and engaging in small movements that will not create further damage to your injury. Your Arne Wellness chiropractor will guide you through the appropriate times to rest in the early stages of your auto injury treatment according to your specific injury. While the soothing properties of heat may seem like the best way to relieve pain and inflammation, applying heat to injured areas does just the opposite. Heat actually contributes to inflammation, especially within the first 24 to 48 hours of being injured. Instead, use ice to alleviate inflamed muscles and joints, which will also soothe your pain and aches. Apply an ice pack to the injured area for 15 to 20 minutes and then remove the ice for the same amount of time. Repeat this pattern as frequently as you’d like during the few days of your injury. Your chiropractor will let you know when it is safe to incorporate heat therapy into your auto injury treatment. The worst thing you can do after suffering an auto injury is to ignore it. If you’ve been in a car accident in Littleton, call Arne Wellness Center to start an effective auto injury treatment plan that will be personalized to address your specific injury. Starting chiropractic care immediately after your accident will be the most efficient way to treat your pain and inflammation. Contact us today.